Milt Krieger, a Western Washington University emeritus professor in liberal studies, shared stories from his book on local jazz at the Western Libraries Spring Reading Series event from 4 to 5:30 p.m. Thursday, April 24.The event took place in Special Collections on the sixth floor of Wilson Library. 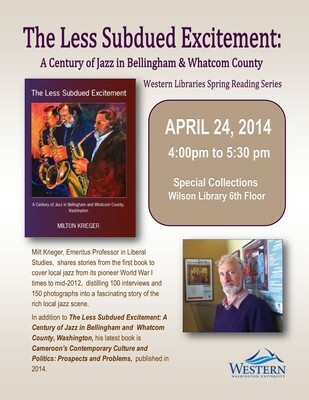 Krieger's book, "The Less Subdued Excitement: A Century of Jazz in Bellingham and Whatcom County, Washington," covers local jazz from its pioneer World War I times to mid-2012, distilling 100 interviews and 150 photographs into a fascinating story of the rich local jazz scene. Krieger's latest book is "Cameroon’s Contemporary Culture and Politics: Prospects and Problems," published in 2014.